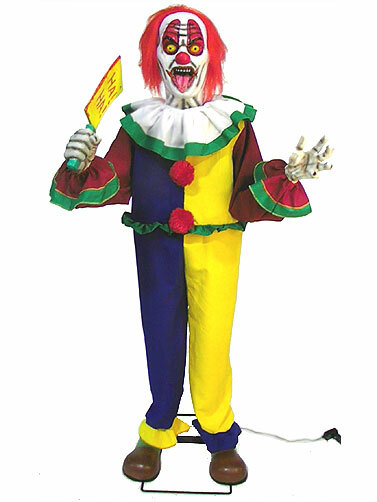 This Animated Cleaver Clown will be a scary prop in your Halloween carnival display and is sure to be a main attraction. 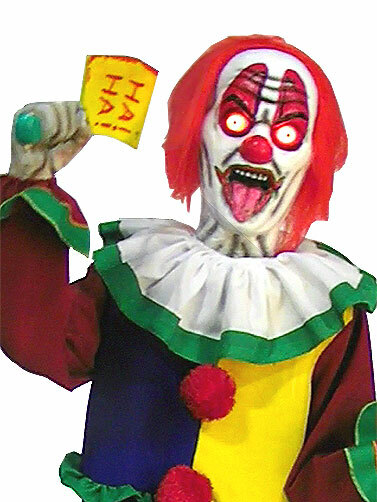 Animated evil clown wears a brightly colored clown suit and yields a bloody cleaver with the words "Ha! Ha!" in it's hand. Clowns body moves side to side and the arm with cleaver moves up and down. Features light-up eyes and plays creepy carnival music with a clown laughing. Life-sized. Motion and sound activated. Includes 5.9V 1000 MA adaptor. Plastic. Recommended for indoor and covered outdoor use. Animated Cleaver Clown measures 6'H. This is an oversized item that will ship separate from other items in your order. A $15.00 surcharge will apply to the regular shipping costs for your order. © Copyright 2019 Darkside Displays. All Rights Reserved.